Paris is truly one of the great cities of the world. It is known the world over as being romantic and for many of its attractions. Is there a better known building in the world than the Eiffel Tower? 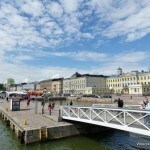 We were happy to find that it is also a great city for families. 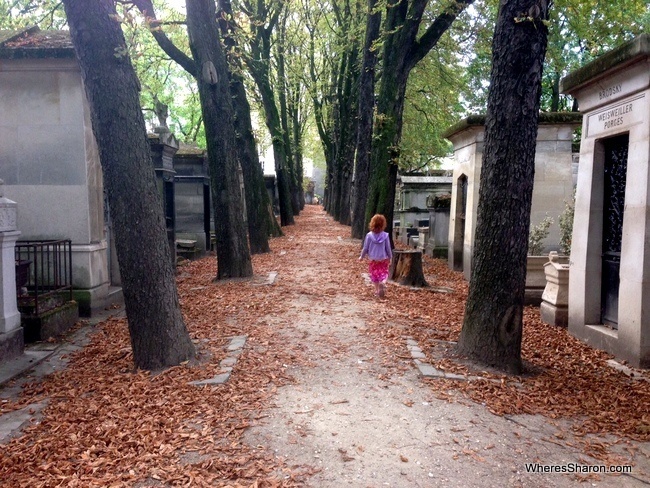 There are so many things to do in Paris with kids. Thereby car are a crazy amount of Paris tourist attractions and many work well for families. There are also custom built attractions for families. The metro, wide footpaths and the boulangeries (bakeries) on seemingly every corner also make this an easy place to explore with kids. We were lucky enough to spend an entire month in Paris in the middle of summer. The weather was beautiful – most days were high twenties or thirties which surprised me. There are many tourists about – but only at some attractions. Most of the time we did not really notice tourists that much. We rarely lined up for anything and we did not find it a problem being in Paris at a peak time. The only annoyance was that many local shops shut over the summer. Many shops, restaurants etc shut for August in the neighbourhood where we were staying. Many were still open though so this was not a big deal. 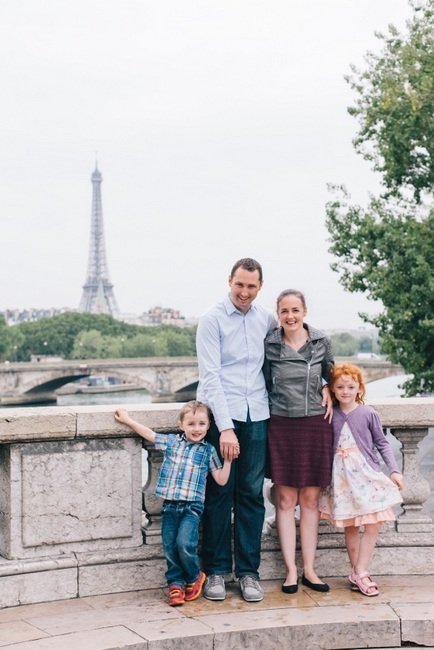 Below you will find our list of the top things to do with kids in Paris, how we found being with children in Paris, where we stayed, where to eat, how to get there and how to get around Paris. We hope it helps you have as fantastic time in Paris as we did. 1 Top 26 things to do in Paris with kids! 1.22 Have a photo shoot! 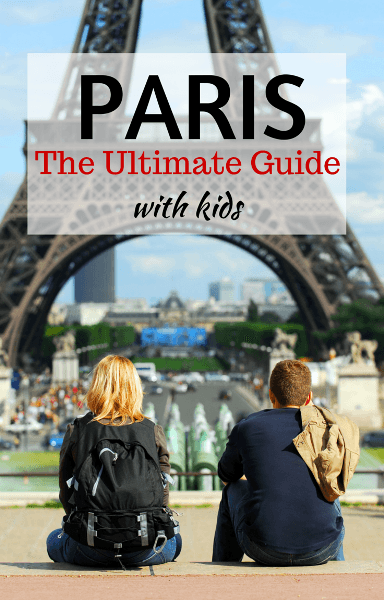 Top 26 things to do in Paris with kids! 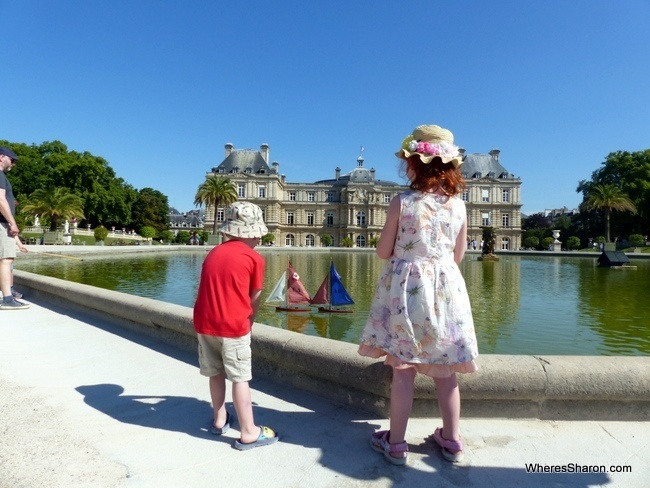 If you are wondering what to do with kids in Paris and whether the traditional top Paris attractions work well with preschoolers in tow, here are our thoughts! This famous landmark is my favourite place to start a Paris adventure and that’s exactly what we did. We caught the metro right here then climbed to the top. There is a small museum inside at the top, but the highlight by far are the great views all over Paris from the top at 50 metres high, especially down the Champs-Elysees and over to the Eiffel Tower. A dozen broad avenues start here and looking along them makes for magnificent views. I just love it! The arch itself is also impressive and it was cool to ascend from the metro station to see it in front of us. The kids were not as impressed but they did a great job of walking up the the 284 steps to the top. 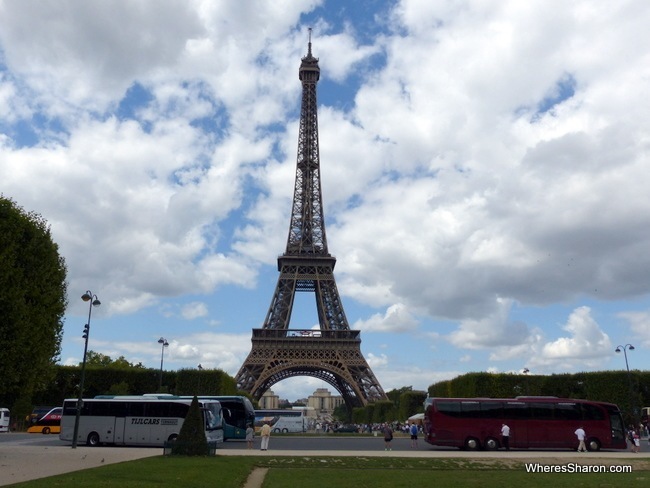 Miss 5 even recognised the Eiffel Tower – she has seen it in kids TV shows. We were able to leave our pram at the bottom with the person who checks the tickets. If you are wondering what to visit in Paris first – this is my pick! Under 18s are free, adults are 9.50 Euros. We went on a Saturday afternoon at the end of the Tour de France so there was a line but it moved fast. 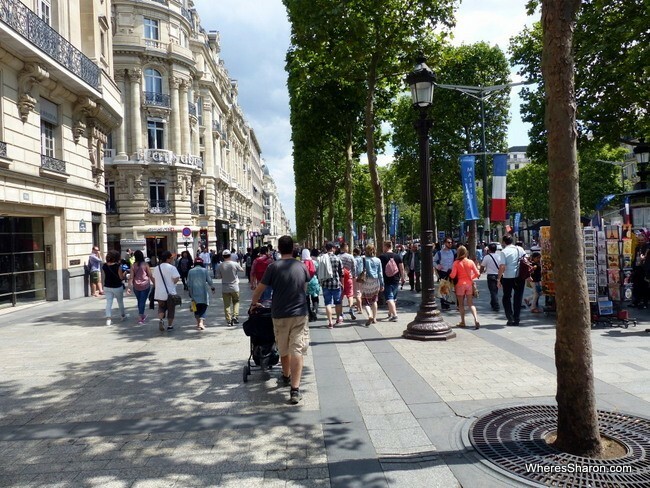 After descending from Arc de Triomphe there is only one thing to do – walk down the Champs Elysees. 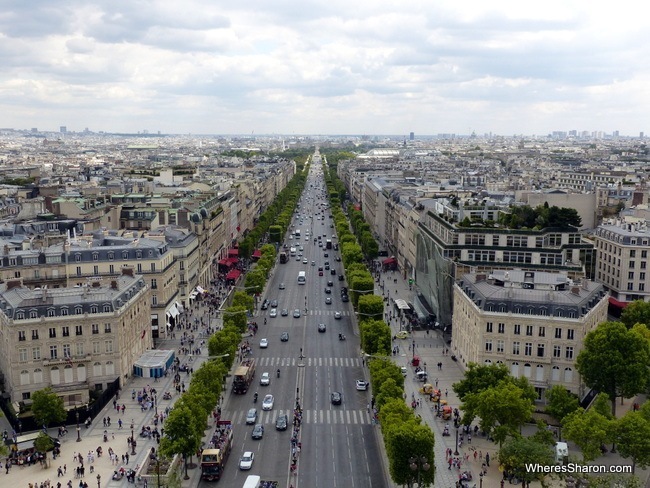 This broad avenue must be one of the most famous streets in the world, and it is the site of many French events – on the day we strolled down they were getting ready to celebrate the end of the Tour de France and we saw many contestants ride past. The street is packed full of restaurants, shops and cinemas. The footpath is very wide – thankfully, since it was very busy when we were there. It is a nice place to walk and really soak up the fact that you are in Paris. The best part for me about this strip is that it took us from the Arc de Triomphe all the way to the Place de la Concorde, the Louvre and the gardens around the Louvre. Walking down here is obviously free although be aware that you may be tempted by shops along the way! 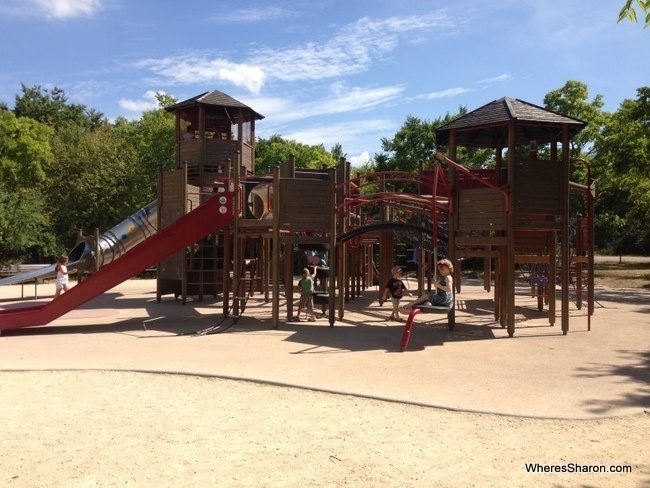 This 28 hectare of city park is located inbetween the Louvre and the Place de la Concorde and is an excellent place to break up the journey between the Arc de Triomphe and the Louvre if you are in Paris with children and even if you are not. This big park was created in 1664. There are art galleries at the Orangerie Museum and the Gallery. However we came here to chill out and let the kids have some kid time! 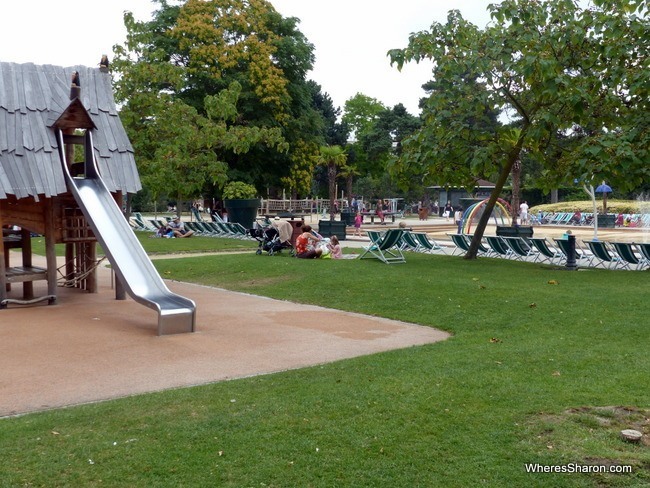 There is a great little playground with lots of shaded seats as well as a fun park in summer. The kids loved the playground especially because this is a great place to find kids in Paris from all over the world. Miss 5 was happy to make some English speaking friends. If you are so inclined, there are lots of kid friendly rides in the fun park as well as some more thrilling ones for daredevil adults. I think it may be impossible to visit Paris without going to the Eiffel Tower. This must be the most recognised structure in the world! Even our 5 year old was very impressed and excited when we first viewed it on the way here – the first time I have seen her so impressed by anything which isn’t a kid attraction. She kept saying “oh my gosh” over and over again! The most obvious thing to do here is obviously to go up to the top – I definitely recommend a lift pass with kids. The best thing to do with kids at the Eiffel Tower, however, is to just hang out at the Champ de Mars. This big grassy area has a great atmosphere and obviously a great view. There are also three playgrounds – at least I read that there is although we only found one. There was also a roller skating rink when we visited, a clown and a great party atmosphere. The Musee d’Orsay is one of Paris’ biggest art galleries and one of the top attractions in Paris. 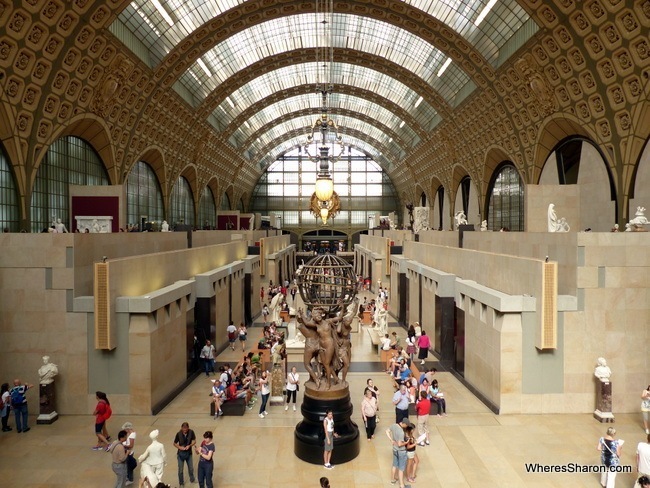 Housed in a beautiful turn of the 20th century former railway station, the collection of the Musee d’Orsay picks up where the Louvre ends, covering art from 1850 up to around World War 1. There’s some big developments in art during this time – like Impressionism – and the museum has some of the best collections by artists like Monet, Manet, Renoir, Cezanne (and others) anywhere. They have a good collection of paintings by Van Gogh and sculptures by Rodin as well. All of this makes for one popular destination. I got there on the 9:30 opening time only to be greeted by a massive queue. It moved quickly but it still took me over 20 minutes to get inside. The queue never got any shorter either – it was as long when I went in as when I got there. It was even longer when I left hours later round lunch time. So either get there really early or maybe later, especially on Thursdays when it is open till 9:30pm. The collection – which is large – is organised by time and artistic style so if you know what you like then I’d do them first. Especially if you’re there early. The Impressionist collection (which is on the very top floor) and the Van Gogh section were very busy. Otherwise the museum is well spaced out. Even if you’re not much into art the collection has lots of work that you’ve probably seen reproduced somewhere and now you get to see for real. If you’ve even a passing interest in art its one of the better museums to visit. I’m glad I went. And for kids? There’s nothing for kids – no kids section or activity area – so they can’t get involved in anyway. It’s all passive. It’ll work for some kids and not for others. I would have taken S, if she wanted to go, but not Mr 3 who is too young to appreciate or care about the art. 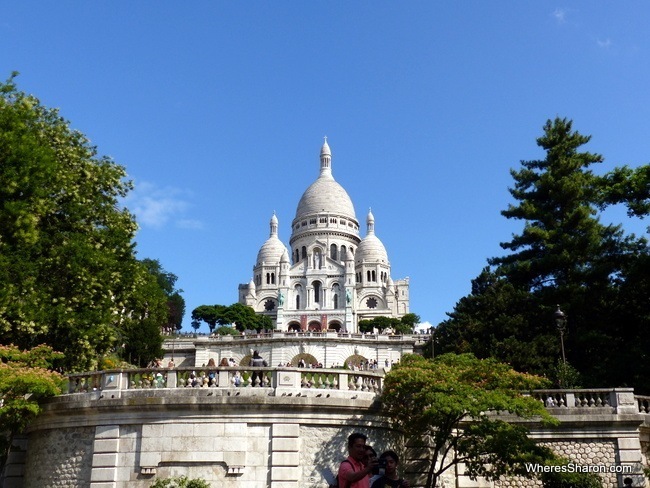 Visiting this well known Basilica is an essential Paris thing to do. Being on top of a hill, it is quite a landmark. This also means that there are great views of Paris from here as well. The church itself is beautiful inside. It is set up so people can pray continuously so no talking is allowed. You are not allowed to take photos or film either (not that that stops many people). Mr 3 was in a bad mood so we didn’t take him inside out of respect, but S enjoyed it. You can also climb up the dome for an extra fee for views, but we found the views more than sufficient from out the front. There are a lot of steps – we walked up them which was a mistake – at least with Mr 3 and the stroller. We should have taken the funicular which I believe uses the normal Paris metro tickets. For kids, there is also a playground and a carousel at the front. We left Sacre Ceour by going out the western side entrance. I enjoyed the walk to the closest metro station on this side (Chateau Rouge) far more than the walk to Anvers. It was far less touristy (and cheaper if you need to eat). It is a nice area to walk around. This massive science museum was a huge hit with us and is one of the best things to do in Paris with kids. 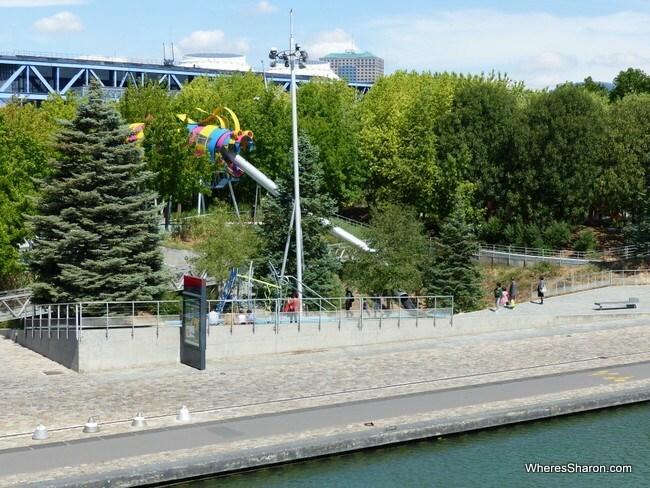 It is located in the Parc de la Villette (more about this below). There are three floors of exhibits, cinemas, a planetarium and an old submarine. The downside is that different exhibits have different admission charges. 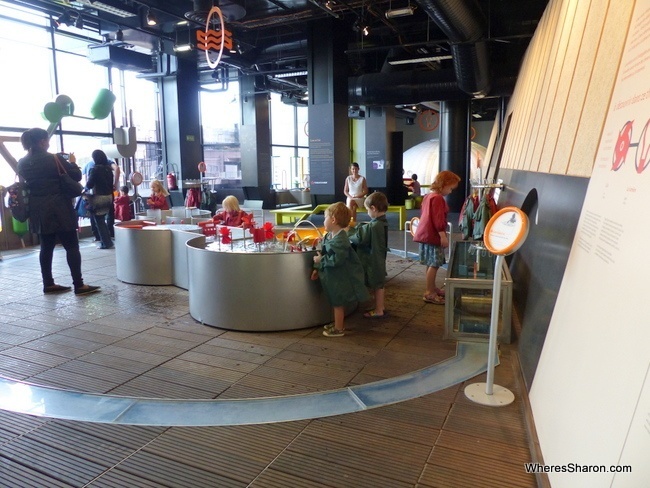 We decided to visit the Cite des Enfants for 2-7 year olds as this seemed like the best area for preschoolers after we watched the video’s on the Cite des Sciences site which show each of the exhibits. It was a great choice! Especially if you are looking for the most fun kids activities in Paris. This area has 5 different sections all of which are hands on. It was very active but far less science-y (sorry not sure how else to describe it!) than other science museums we have been to. The kids did things like cart around building blocks to build walls, run around cool mazes, played with water and saw a million versions of themselves in mirrors. Our 90 minutes allotted time flew by and the kids absolutely loved it. The general exhibition areas looked fantastic and with older kids, I definitely would have checked out these too. They did not look suitable for preschoolers however. It’s recommended to buy tickets online before visiting on their site. We had no problems purchasing them the night before in a peak time. It cost 9 euros for an adult and 6 euros each for the kids plus a 2 euro booking fee for 90 minutes. Not cheap! But we think it was worth it. This park is absolutely amazing – surely one of the best in the world! It’s home to many buildings – the Cite des Sciences, a cultural centre and many more – but there is still plenty of wide open space, a canal through the middle, some interesting structures and (the best part) many themed gardens. We loved exploring some of the different gardens. By far the favourite is the Dragon Garden with a massive dragon’s slide. Miss 5 loved making the big climb up to the massive slide (pictured above). It is lots of fun. We also especially enjoyed the Dunes Garden where the kids could bounce, do what amounted to an obstacle course and there are also some decent sized flying foxes. If you are looking for amazing places to visit in Paris for children, we would definitely recommend a visit to this park and the Cite des Science. They make for a great day and, after Disneyland, it is the place that they say is their favourite. We even went back out to Parc de la Vilette a second time. Everything we did at this park was free. There is a metro station on each side so it can make sense to start on one side and slowly make your way to the other. 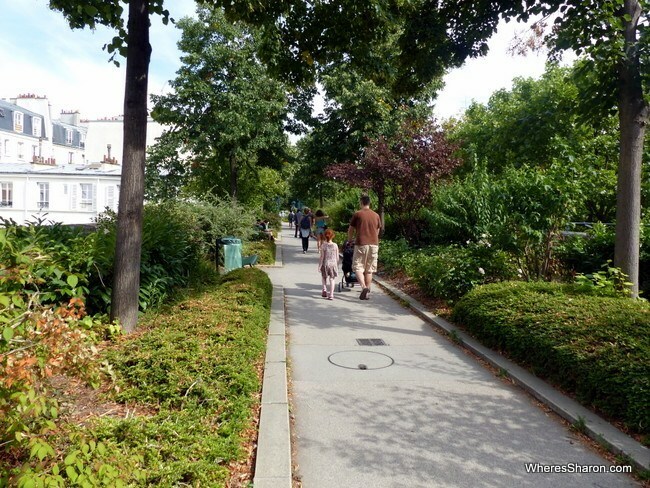 Another of the great things for kids to do in Paris is to walk along the unique Promenade Plantee. Promenade Plantee is a fabulous green space on an elevated walkway built on a disused railway line three levels above ground. It has all the usual park items including benches, a water feature and gardens. It’s a lovely place to walk with quite a buzz on a summer’s evening. There are also some nice views looking down on the Paris streets. It’s the perfect place to stroll with kids with no worries at all about cars. There’s also a fabulous park where the walkway comes down to ground level at Jardin de Reuilly. There are staircases up to the walkway on most of the city blocks underneath it. This historic Catholic cathedral is surely one of the most famous in the world and it is definitely worth adding it to your list of things to do in Paris for kids. Notre Dame was built on the site of earlier churches and temples and was started in 1163. It took a long time to finish and was extensively renovated in the 1800s, but the results today look great. It’s big, grand and ornate and there are some fabulous stained glass windows. 14 million people visit a year and it was crowded on our early August visit, but we didn’t line up for more than 5 minutes and the kids enjoyed walking around, especially 5 year old S who is finding religion quite fascinating at the moment. I recommend walking around the back of the church. There is a peaceful park area which was basically empty when we visited despite the huge crowds on the other side. There is also a small playground to the right of the entrance. It’s only really suitable for toddlers, but it is a great option if you don’t want to take your children inside. Entry is free although you pay if you want to climb up the tower. There are free tours as well. Conciergerie was built as a royal palace in the 14th century but later became a prison and torture chamber and is best known for its role during the Reign of Terror during the Revolution. This history is what is documented here. In addition to the hall featured above, there are small rooms detailing what occurred here with reconstructed cells to show how different types of prisoners lived depending on how much money they had. There is also a reconstruction of Queen Marie Antoinette’s cell. I came here alone and although there were people visiting with young kids, there is nothing here for little kids although they may enjoy a peek in the cells. I also have mixed feelings about this attraction. It was interesting on one hand, but I could have got just as much from reading a book – perhaps more since a lot of descriptions were things like this “may have been the site of…” or they “might have had cells like this” but this is not based on evidence. Conciergerie is located near Notre Dame. It costs 8.50 Euros for an adult. The Luxembourg Gardens, a short walk from Notre Dame, are 23 hectares of beautiful gardens that date back to the 1620s. It is also home to Luxembourg Palace where the French Senate currently reside but the main attractions is the gardens themselves. 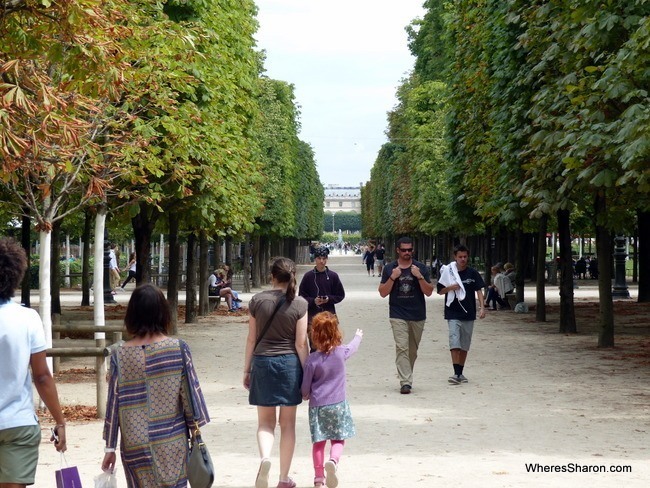 It is one of the most beautiful places in Paris to visit- there are formal terraces, manicured lawns, lots of trees, tennis courts, an art museum, orchards, puppet shows and a great kids playground. The playground was a huge hit, but our favourite part was the Grand Bassin, an ornamental pond with lots of chairs where kids can hire a toy sailboat. The sailboats come in all nationalities and S and Z loved nudging their Australian one around the pond with a stick. It was idyllic. There are also grassy areas where you can picnic. We definitely recommend spending a lazy half day here. It is one of the best places in Paris to visit with kids. The gardens themselves are free but many of the attractions have entry fees. The sailboats are currently 3.50 Euros for half an hour. The playground was 2.50 Euros for children and 1.20 Euros for adults. In Paris, the kids – and S particularly – have been interested in art. S constantly wants to “make” art, so we headed to the Centre Pompidou. The centre holds the national collection of modern and post modern art (anything after the impressionist era) in a fabulous looking building which has been designed to look as though it has been built inside out. There are also galleries dedicated to other art forms like photography as well. During the school holidays they have activities for kids in Paris so we thought it’d be a good chance to do some art. The centre opens daily (except for Tuesdays) at 11:00. We got there just after, and the line to get in was very long, although moving quickly. By 11:30 it was half the length, by 12:00 there’s no line at all (although when we left around 3:00 there was a queue again). After buying a ticket the first gallery we saw was the kids one which has an interactive art installation. The workshop in progress allowed kids to decorate a paper tag and then attach it to the installation, which they enjoyed. The upper galleries held the modern art collection, with a chunk of Matisse and Picasso, and the exhibits. I wouldn’t have thought this would have been as interesting for kids but some of the art really grabbed the kids imagination and S was particularly curious about some of the pieces. Z just wanted to touch things. We had a good time but it’s otherwise hard to recommend this for younger kids. The Centre Pompidou is located near the Hotel de Ville (Paris’ town hall) and is a five minute walk up Rue de Renard from the Hotel De Ville, its metro station (on line 1) and the many buses that stop or terminate there. Entry was 14 Euros for an adult, kids free. 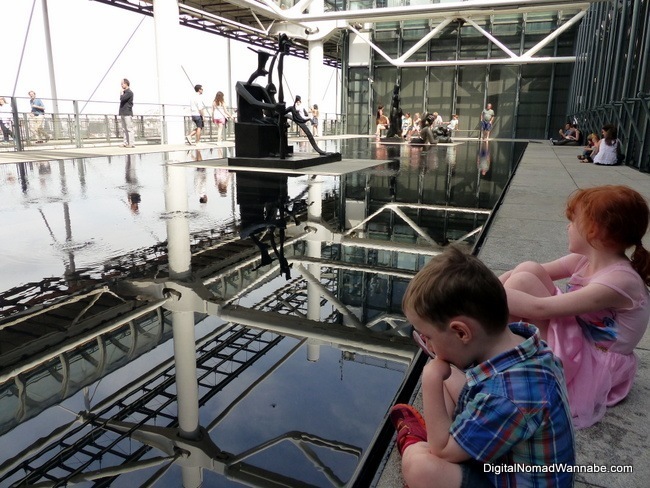 I was unsure whether to include this in our list of things to do in Paris with children as we did not particularly enjoy it. However, I am sure you can learn from our experience. After reading Canal St-Martin is a great place for a stroll and a picnic in our Lonely Planet, we decided to head there one beautiful, early evening. We walked the whole stretch and although it is quite pretty in stretches, I wouldn’t really recommend it. There were groups of young men just hanging out for the majority of the walk which makes me uncomfortable. The first part (near metro Juares) smelled of trash. The canal is also not a great spot for a picnic unless you are happy to sit with your legs dangling over the edge (no way with preschoolers) or on a sketchy bench. We were further disappointed when a big part of the reason we went there was shut – we had read about a pizza place that would give you a pink helium balloon when you ordered so they could find you on the canal to deliver the pizza. All is well that ends well though – we found a creperie and had a yummy dinner anyway and the evening was saved. Not many cemeteries are tourist attractions. And even those that are tend to have – at most – a few well know residents. Père Lachaise is the exception. There’s probably more famous people buried here than in any other general, open to anyone, cemetery anywhere. This may seem like a strange addition to our list of things to do with children in Paris, but it is worth a visit if you have the time. When it was opened in 1804 as the main cemetery for Paris (the others being at capacity) it was Paris’ first garden cemetery but not very popular. However, over the years it’s seen a cross section of the famous and infamous. Musicians seem particularly well represented: Jim Morrison, Chopin, Maria Calais and Edith Piaf are all interned. There’s many famous writers as well – perhaps most famously Oscar Wilde. There’s so many famous people you can get maps showing where they all are. More ominously, the Wall of the Communards is on one edge of the cemetery, where the leaders of the 1870 Paris Commune were executed after the Commune’s fall in 1871. Despite all the death, it’s an interesting place to stroll around and see what remains of some rather famous people. Entry is free and you can enter near the Philippe Auguste metro station. 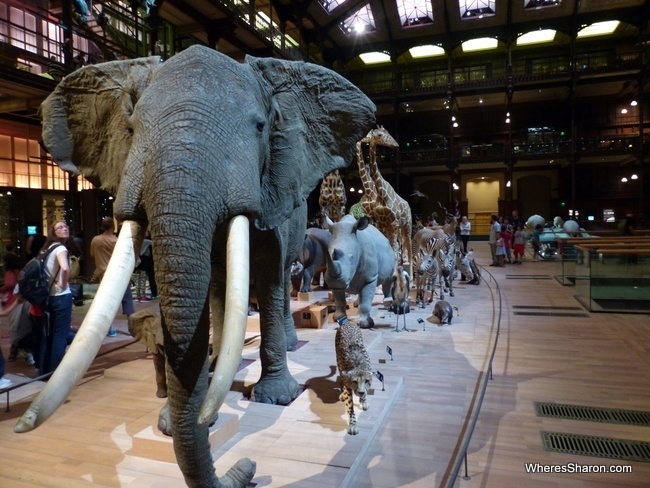 The Grande Gallery of Evolution is another of the family things to do in Paris. It is one of many galleries of the Museum of Natural History, spread around the edges of the Jardin des Plantes, close to Gare d’Austerlitz station. The Gallery of Evolution is home to a large collection of stuffed animals – including big ones like whole giraffes and elephants – and preserved specimens in a beautiful old building. It is surprisingly fun to wander around and take it all in. The highlight of the gallery for S and Z, though, was the Children’s Gallery. While part of the Gallery of Evolution you need to pay extra to enter the Children’s Gallery. To spread people out, the doors are only opened every 15 minutes, and on your ticket (if you pay extra) is a time slot you can’t enter before. For example, our tickets assigned us the 12:15 slot. We could enter at 12:15 or 12:30 or any opening after, but not the 12:00 one or any before. You can stay as long as you like. The Children’s Gallery is full of things kids can touch and interact with and is designed to be entertaining and engaging. There’s a focus on different types of habitats and what animals live in each, as well as protecting and conserving them. Both S and Z were entertained for quite some time and, despite not being a huge space, there is a lot to do. The gallery is recommended for ages 6 to 12 which made sense. There were things for Z to play with, but much of it was to advanced or simply too high. S got more out of it but needed help to understand the significance of what she was seeing. That said, everything was labeled or had audio in both French and English. They enjoyed the Children’s Gallery and the Evolution Gallery overall but other museums were a bigger hit. Entry is 11 Euros for adults, 9 Euros for kids, free for under 4’s. For a different thing to do in Paris for children, consider visiting a Paris beach! 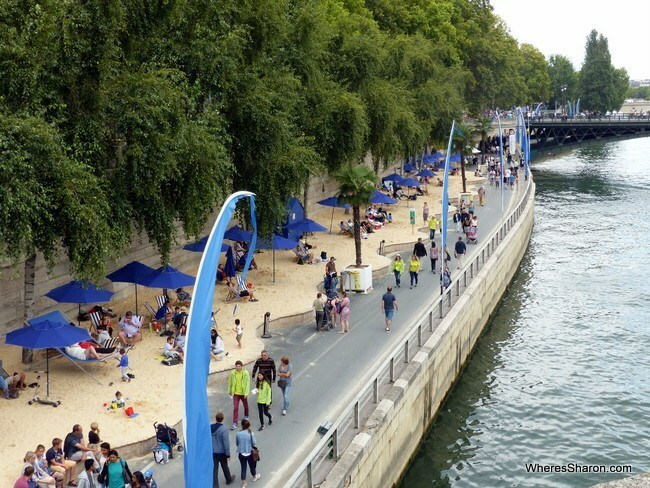 Every summer, parts of the Seine river bank in Paris are covered with sand to form Paris Plage (or beach). Sand and deck chairs are brought in and there are sand castle competitions and water activities. It actually has a beach like atmosphere and the kids loved relaxing and building sand castles. You can find more information here. 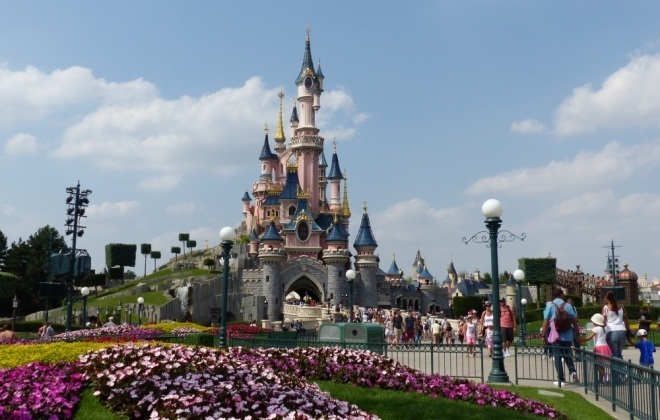 If you want to make your kids’ day/week/month/life, consider heading out to Disneyland Paris which is just a short train ride our of central Paris. I went with Miss 5 and we had an amazing day – so amazing in fact that she keeps calling it her best day ever! 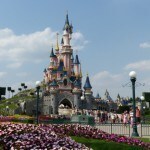 There are actually two parks that make up Disneyland Paris – Disneyland Park and Walt Disney Studios Park. I recommend spending at least a day at each. They are both worth visiting. There are fantastic shows, attractions and that amazing Disney magic. We had a great time seeing ghosts in the haunted mansion, lasering weird space creatures with Buzz Lightyear, watching a car stunt show and singing along to all our Frozen favourites. It is definitely one of the top things to do in Paris with kids and a great way to break up the more adult Paris attractions. Read more information and our tips in our full review. To the west of central Paris lies the massive Bois de Boulogne. This 845 hectare park is massive. 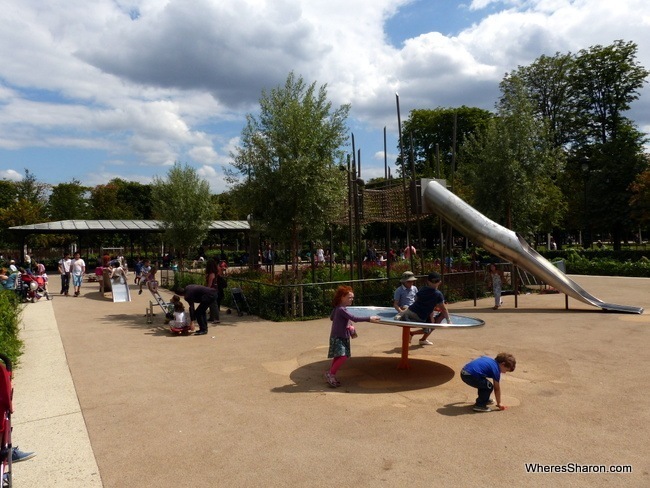 It is also home to the Jardin d’Acclimatation, one of the best things to do with kids in Paris. Jardin d’Acclimatation is the perfect stop with preschoolers and would also work with older kids. It is a combination of playgrounds, zoo, puppet shows, amusement park and just general gardens. Nothing in particular is that special but in combination, it’s a great attraction. There is a water play area which was a particular hit with our kids. There are so many playgrounds I lost count including an extra good “forest adventures playground” which is like an obstacle course for 6-12 year olds but both our younger kids enjoyed it too. We had a fabulous day walking around, playing on the playgrounds and splashing in the water. I was surprised just how good this attraction is as I had not heard it mentioned before and unfortunately it seems that many foreign families skip it – don’t! There are many small amusement park rides – at 3-6 euros a go we gave them a miss, but they looked fun if that’s what you are after. Many things were over priced in my opinion – 6 euros for a bouncy castle! But we managed to spend just about an entire day here without paying a cent above the entry price so it also makes for a great budget day out. Basically this park is just full of Paris activities for kids. There are many eateries but I recommend doing what we did and taking a picnic. Entry is 3 euros per person. There are extra costs for rides and some of the attractions. On the opposite side to Paris to Bois de Boulogne lies Bois de Vincennes which is even bigger. Inside Bois de Vincennes lies Parc Floral de Paris, a botanical garden. This is a big park. There are many small attractions although we found them to be mostly shut. Thankfully, the main reason we visited here was fine though – the millions of playgrounds. The playgrounds at this park seem to go on and on and are probably the best I have experienced here in Paris, apart from maybe Parc de la Vilette. There are play areas for all different ages and even older kids could have fun here. I would’ve like to climb on some of it myself had there been less people around! There is also a small maze at the entrance that the kids could have played in all day in itself. I also found this park more peaceful than others we have visited with less background traffic noise. My only complaint is that there was just one toilet and it was the opposite end of the park to the playgrounds. Quite a walk and not good with a three year old who needs to go NOW! Parc Floral is definitely not a must visit things to do for kids in Paris. However, if you are staying this side of the city and have younger kids, it’s a fun place to let off some steam. In summer, entry is 6 Euros for adults on Wednesdays, Saturdays and Sundays so visit on a different day 🙂 It is free every day at other times of the year. 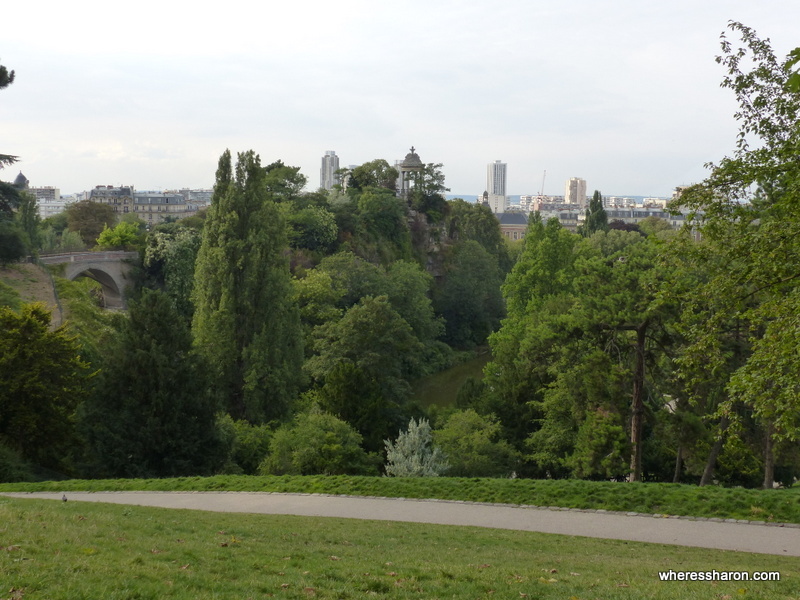 In the north-eastern corner of the 20 arrondissements lies Paris’ fifth largest park, Parc des Buttes-Chaumont, and possibly one if its best for kids. The park is built around a small artificial lake and is well known for its small “temple” inspired by of Tivoli’s Temple of Vesta that towers high above and offers great views of Paris’ northern suburbs. The park is built on the a hill and so has lots of sloping lawns (you don’t have to keep off the grass) that make great spots for picnics with incredibly picturesque views of the park’s trees, the lake and the city beyond. We could even see the Sacre Coeur. Less formal that the Luxembourg or Tuilleries Gardens the park is a beautiful place to relax or play. There’s a lot of facilities as well – especially for kids. There’s two playgrounds at the Eastern and Western corners, three restaurants and two creperies as well as two kids marionette theatres – but the eateries and theatres were closed for the summer when we were there. There’s even an artificial grotto with a waterfall using water from the lake. It’s J’s favourite Parisian park. This might seem like a strange addition to a list of Paris attractions. However, if you were ever going to pick a place to have professional photos, could you choose a better place than Paris? There is something so magical about this city and the Eiffel Tower, so why not take home the ultimate souvenir with a professional photo? We can personally recommend Goncalu from Flytographer. Read more about our experience here. 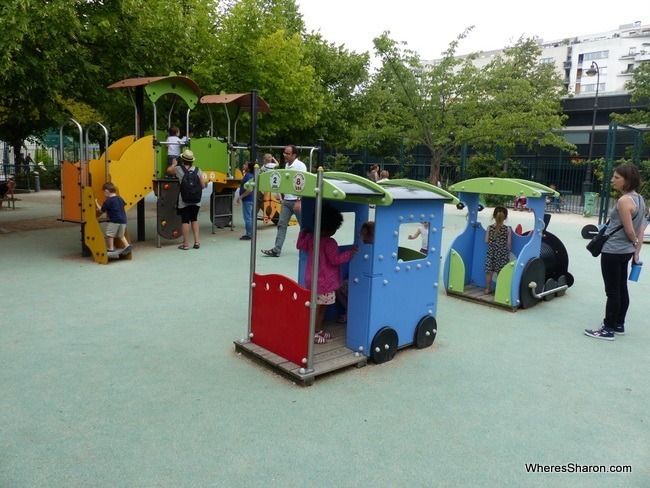 To finish off our list of what to do with children in Paris is a list of playgrounds that we personally visited that we haven’t already mentioned above. Louvre – the famous Paris art gallery. We can’t imagine enjoying this with our young kids but yours might be different. Paris Catacombes – explore Paris’ underworld with a look at the sewer system and some of the 6 million skeletons under Paris. Musee de l’Armee – Paris’ Army Museum has a big collection of military weapons and is home to Napolean’s tomb. Find more fun things to do in Paris here. We were concerned about visiting Paris with kids after hearing it was not very kid friendly. We did not find this to be the case. Our kids were 3 and 5 when we visited. While our kids were not embraced like they are in Malaysia and all the museums weren’t super child friendly like in Stockholm, they were at least tolerated everywhere. No one complained or seemed annoyed with us and S received quite a few compliments on her beautiful hair. As you can see from above, there are plenty of great Paris attractions for kids. People were also very helpful when we needed it, often seeming to appear out of nowhere when we struggled to get the stroller into the metro or dropped a bag. On the other hand, though, I did often feel self conscious as Paris kids do not seem to make a sound! They are not like Australian kids at all in this respect and our kids are loud even by Australian standards so I spent more time than I probably needed to trying to get them to lower the noise level. I also struggled to feel comfortable taking them to restaurants as it was very rare that I saw kids eating out. There are some fantastic family friendly hotels in Paris. Read this article if you are looking for the best family hotels in Paris. However, if you are going to stay in Paris for awhile, like us, I recommend looking at Airbnb. We stayed in a one bedroom apartment in a nice neighbourhood for only AUD$1400 (currently just over US$1000)! If you don’t have an account with Airbnb yet, sign up with this link and we will both get US$25 off our next booking. If you want a cheap stay, I also stayed in the Hotel du Maine while we were in Paris. It is good value although the only way to cool down in summer was to open the windows which made things quite loud. Four Seasons George V Paris – This luxury hotel is not only in a fabulous location for checking out the biggest sights in Paris but is also very family friendly. There is a pool, family play areas, games, DVDs, events and more. A babysitting service is also available and kids under 18 are free using existing bedding. Click here for the latest prices. Hotel Fouquet’s Barriere – This is another top choice for families. On arrival, kids are given a passport with access to treasure hunts, games and coloring activities. Kids under 4 are also catered to with workshops. Click here for the latest prices. Novotel Paris Centre Tour Eiffel – A great choice for families on a budget who want a top location. This hotel is family friendly, with kids under 16 staying free, but has a lower price tag, thanks to not offering lots of luxury extras. However, there is still a pool, play area, video games and children’s menus! Click here for the latest prices. Hotel de France Paris – A budget option with triple rooms available close to the metro and Sacre Coeur. Click here for the latest prices. 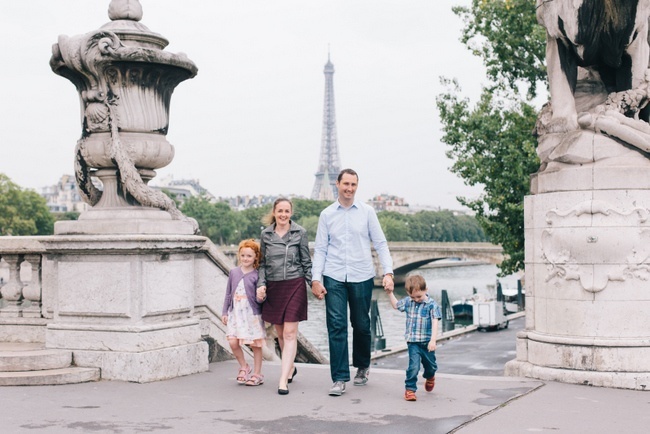 You can find more choices in our full guide to the best family friendly accommodation in Paris. Paris is renowned for its food and there are restaurants, cafes and food outlets everywhere – you are sure to find something you like. Paris restaurants are pricey so on our budget, we could not eat in restaurants often. However, when we did, we were very happy! We particularly enjoyed creperies. These places are delicious, great value and work well with kids as I imagine there are very few kids who wouldn’t enjoy a delicious French crepe. We also loved the cider that was sold at creperies. I have never been a fan of cider until now. French cider is delicious! If you want to try out a French creperie, I particularly recommend going to the southern end of Rue de Montparnasse. There are many here. I tried two and they were both delicious. Creperie La Bigoudenne, Rue de Montparnasse – 9.50 euros for 2 courses, sooooooo good! A great way to enjoy eating in Paris with kids is by having a picnic. We had so many picnics with yummy fresh French produce and they were a fantastic way to eat for all of us. When we were in a rush, the local boulangerie (bakery) also worked out very well for a kid friendly meal on a budget. Thanks to Paris being the most popular tourist destination in the world, you are never going to struggle to find a way to get to Paris. There are flights from many parts of the world and it is also very well hooked up by train and bus to the rest of Europe. 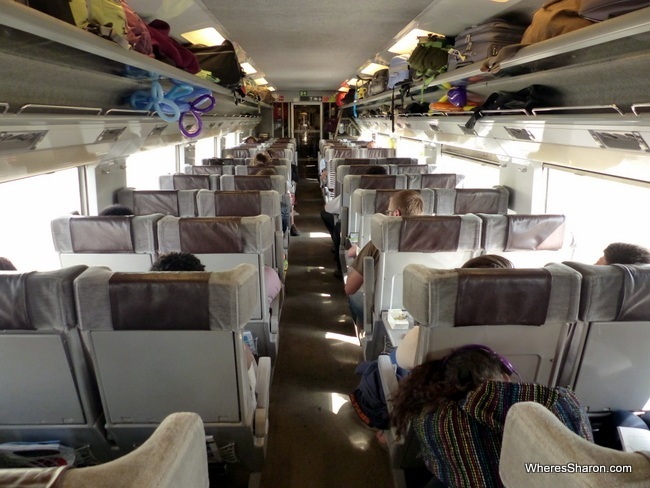 We looked into both London to Paris flights and catching the Eurostar from London to Paris. Flights were cheaper – but not once we took into account getting to a London airport so we were very happy to have an excuse to travel from London to Paris by the Eurostar. The Eurostar is awesome. It takes about two hours and is just so quick and easy. It leaves and arrives in central London and Paris. All border formalities are very quick and taken care of before departure. We were surprised just how quick the border formalities were given when we first arrived in the EU on this trip in June, we were asked lots of questions in many different ways like they were trying to trip us up. In London, we also were asked many questions and had to show a flight out of Europe. The Paris border people did not even look at our passports. They simply opened them to the back and stamped which was a relief since we were still having to travel with S’s damaged passport at that point. The Eurostar to Paris from London was incredibly smooth and we were in central London in no time. I would definitely recommend this option rather than flying. You can buy tickets online here. It cost us 124 pounds in total for 2 adults and 1 child. under 4’s are free if they don’t occupy a seat. S, Z and I were able to sit sharing two seats without a problem. It is very easy to work out how to get around in Paris thanks to a very convenient Metro system. Public transport in Paris is superb. There are metro stations just about everywhere. The downside of this, however, is that trains stop a lot which means short journeys can take longer than you would expect. They are very convenient though. There are also RER trains which are bigger and faster since they stop less often. Buses are also a great option when they are going where you want ESPECIALLY if you have a stroller. The train system is not stroller friendly – there are steps everywhere and trying to change train lines with the kids and a stroller alone was something I found quite stressful. In fact even entering a metro station with a stroller can be hard. Thankfully, once you are outside, Paris is very stroller friendly. There are nice wide footpaths and we found it very easy to push around. It is also convenient to get to and from the airports in Paris with multiple public transport options. A good alternative for getting around Paris and surrounds is to hire your own car. This is especially a good idea if you want to do some day trips out of Paris or plan to explore Europe more. You can find some car hire options in Paris here. 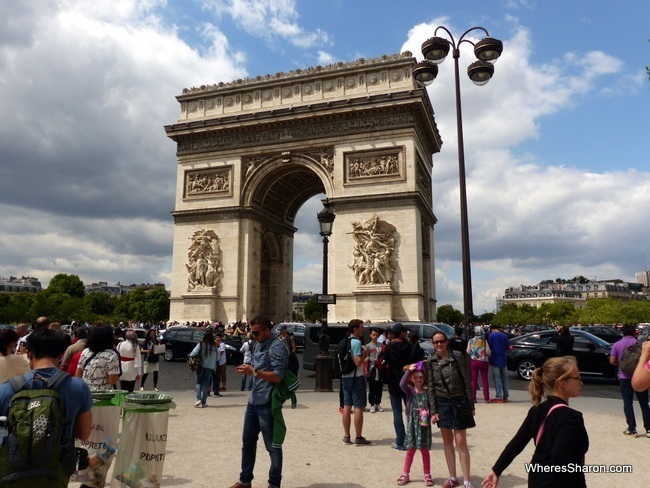 Our budget in Paris was our usual AUD$115/USD$85/EUR76 a day. We failed! Paris is not cheap. I am happy to say though that we only averaged AUD$135/USD$99 a day which I think is a bargain. We did not eat in restaurants often but otherwise we basically had and did what we wanted. This does not include Disneyland Paris. It seems ridiculous now but I actually was worried about visiting Paris with children. I had heard that it wasn’t very child friendly, that people would be rude and not tolerate our kids. This was not true at all. I have also been to Paris twice in the past and although I didn’t dislike it, I didn’t love it either. The idea of a month in Paris did not fill me with excitement and we actually regretted booking this stay at one point. That was until we arrived in London and the friends we stayed with gushed about how they had felt the same and then on their latest trip they had the best time. They said that it was so much better not just going to the main tourist attractions, having time to visit the less famous things to see in Paris and just hanging out and enjoying life. I absolutely agree. Taking the time to just enjoy the fact that you are in Paris is priceless. There is just something so special about this city which is easy to forget if you are staying in the centre of things and zooming around quickly between the main attractions in Paris. I also want to state that I found the stereotype of rude Parisians to be completely untrue. No one was rude to us at all ever. We don’t speak french unless you count saying “bonjour” and “merci”. The best thing about Paris for me was when I was just walking along, gazing in the cute French shops and enjoying the cute French streets. There is a lot to love about this magical city. So yes, je t’aime Paris! And we highly recommend it for other families, couples, solo travellers, everyone! Disclaimer: This article contains affiliate links. If you make a purchase after clicking on one, we may receive a small commission at no extra cost to you. Thank you so much for supporting our family travel blog. Did you stop in the Buttes Chaumont. This is my favorite park in Paris ! I lived in Paris and disagree with the “not very child friendly”, but it’s not friendly with baby. At all ! (my daughter was nearly 2yo when we left). And august is the best time of the year to enjoy the city, less people, less stress, easier to stroll around. Hi Tiphanya! No we have not been to Buttes Chaumont but we have a few more days here so we will try! My husband had also read good things about that. 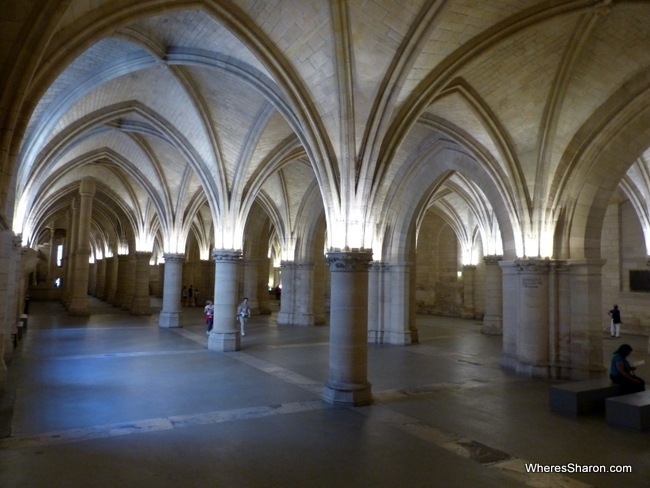 Just the 1.11 is named Conciergerie…. not concierge. 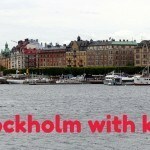 We are heading over on our first big Europe trip with our toddlers (2 and 5) and your blog is making me wish that i’d booked for longer than 6 weeks. I had originally budgeted double your daily budget and have been stressing out that it wouldn’t be enough money. 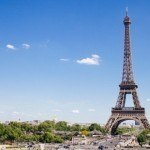 But, after reading this I am excited and know that we can cut down our budget and have an even better time than I originally thought (I too was not the biggest fan of Paris on my last trip). Can I ask though, where did you stay in Paris? The cheapest I have found that seems like it would work for us is 104 AUD a night but am hoping to find somewhere far cheaper. I have no idea where we should be looking at staying location wise and thought somewhere near the Luxembourg gardens would be easy with the girls but if you have any other suggestions than I would love to hear them. Hi Amanda! Europe has so many awesome destinations that I’m sure we could spend years and still have many places on our wish list! 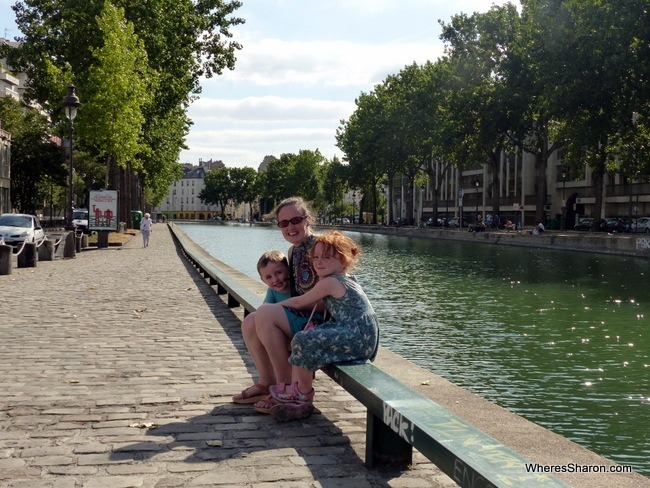 6 weeks is a nice length of time to be away with the kids though – what our 3.5 months in Europe taught me last year was that I don’t want to do longer than 6 weeks on the road with the kids again actually!! Europe can really be as cheap or expensive as you want. I used to have a link in here to exactly where we stayed but it’s no longer on Airbnb 🙁 We only got such a great price as we spent a month which gives a much better nightly cost. $104 sounds like a great price! We stayed in 11th district. As long as you are somewhat central and near a train station you will be fine, but I would have loved to stay near Luxembourg Gardens so we could have gone more often. I hope this helps!